CIO- David Watson CFO- Ryan Kreinbring CNO- Susan Besheer DON- Elizabeth Acord HR Director- Connie Egerer Director of Compliance- Connie Egerer Good evening everyone, thank you so much for joining us this evening for our presentation of our LMS vendor selection process. I would like to take this opportunity to introduce our team members and also the roles that they played in our discussions and decision-making process. David Watson will be playing the role of our CIO, Ryan Kreinbring will be playing the role of our CFO, Susan Besheer will be playing the role of our CNO, I played the role of DON, and Connie Egerer played the role of both HR Director and Director of Compliance for the purposes of this discussion. 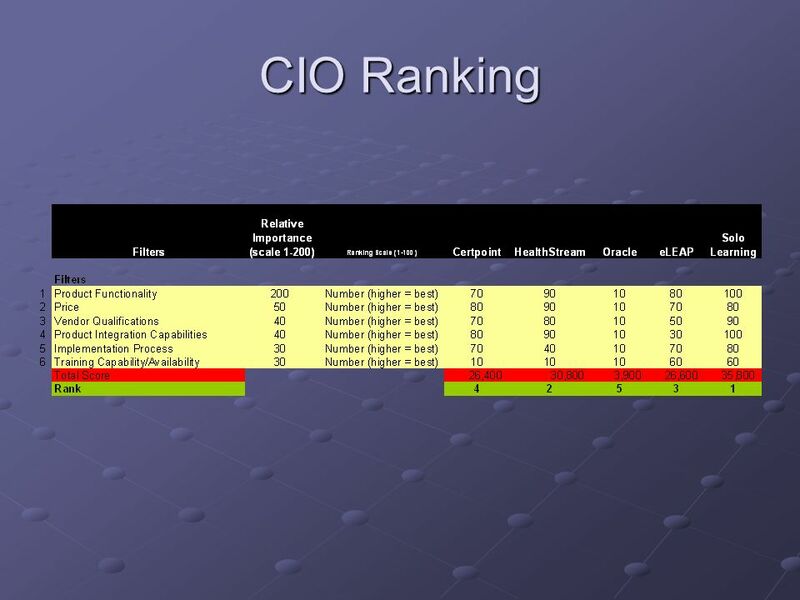 3 CIO Ranking The Rankings on this page reflect my opinions of both the RFP responses as well as the functionality shown in the spreadsheet. Due to my past experience, I leaned more towards the written responses than the excel spreadsheet because most vendors will claim to be able to do most things. 6 CFO Ranking Thanks Bryan, as you can see from the table my scoring was fairly close across the board. I did not see a major outlier across the Vendor’s and they were all in line with the industry. My primary concern with the selection was price. Since the Joint Commission visit was unannounced NCH did NOT have funds budgeted for this system. We were caught off guard by this capital expense and thus price weighed heavily. NCH does keep a fund with a fixed amount budgeted for “emergency” Joint Commission unsatisfactory marks. With that said, the board approved a withdrawal of those funds for this system. We have secured $80,000 for fiscal year 2010 and will begin budgetary process for 2011 funds (ongoing maintenance etc…) out of the normal operating budget. It’s very important that we be cognizant of the $80,000 as it will not be good to go back to the board and ask for more money out of the emergency fund. Also with the $80,000 withdrawal the board has tagged this fund as critically low and it will be very difficult to get more out of it when their concern is replenishing the funds (not taking more out). As you can see from the table my #1 was Solo Learning and eLeap was a close second. In the next 2 slides I hope to illustrate a little more on how I came to these scores again with the major emphasis on price. 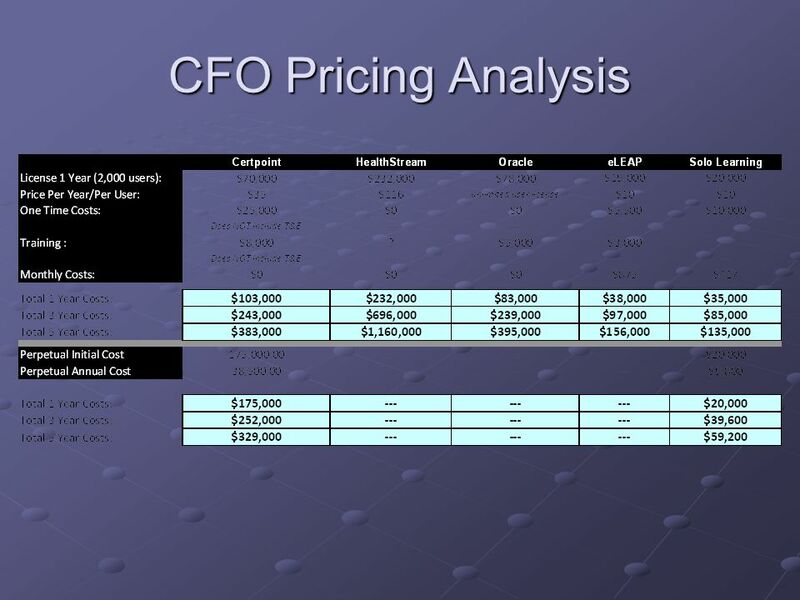 7 CFO Pricing Analysis The following illustrates my team’s breakdown of costs by the various RFP’s. While there was not a large overall vendor deviation there was a fair amount of deviation on price from the most expensive (1 year) of $232,000 to the cheapest of $35,000. As I stated above the price alone almost finalized the removal of CertPoint and HealthStream as NCH simply doesn’t have the funds for these Vendor’s. If we wanted to select one of these vendors we would have to hold off any work until 2011 (at least) and CEO wants to start on this ASAP. While the price does seem to indicate a very high level of quality from these vendors I do not see a reason the cheaper vendor’s cannot get the job done well. Also eLeap and Solo Learning have reduced costs over the initial purchase year. These figures should fit into the NCH 2011 budget. Also NCH was pleased to see Solo Learning’s offer of a perpetual license. This will allow substantial savings over years 2-5 for NCH. It should be noted that these figures will need to be confirmed by the Vendor before final selection as some data extrapolation was done and we want to ensure it’s still accurate. 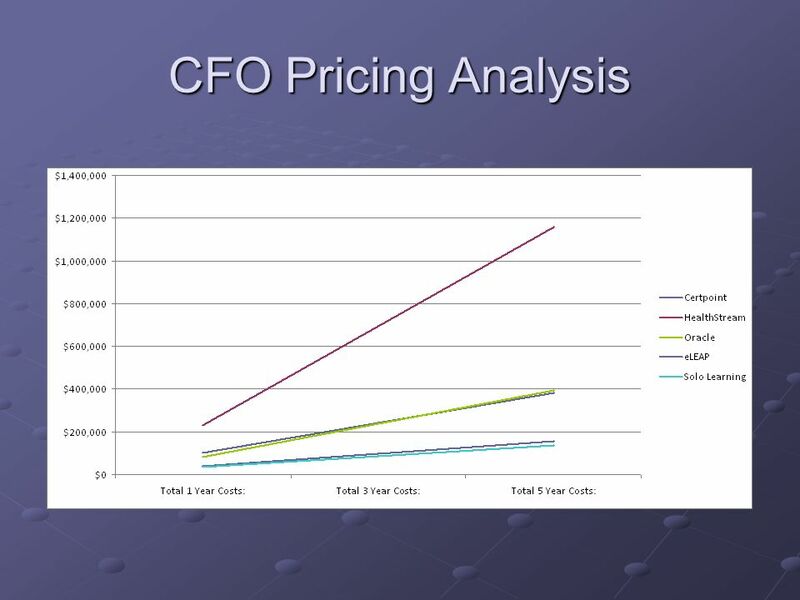 8 CFO Pricing Analysis The following graph also illustrates the vendors costs over the 1, 3, and 5 year terms for NCH. It clearly shows the expensive Vendor’s (CertPoint and HealthStream) total cost of ownership continues to climb. eLeap and Solo learning however offer much smaller incremental yearly costs over initial investments. The following slides clearly demonstrate my preference for Solo Learning. Solo Learning has a very impressive list of reference clients and I feel the cost is a value to NCH. After talking to the rest of the team the price fits into NCH’s budget and Solo seems to be the best value per dollar. 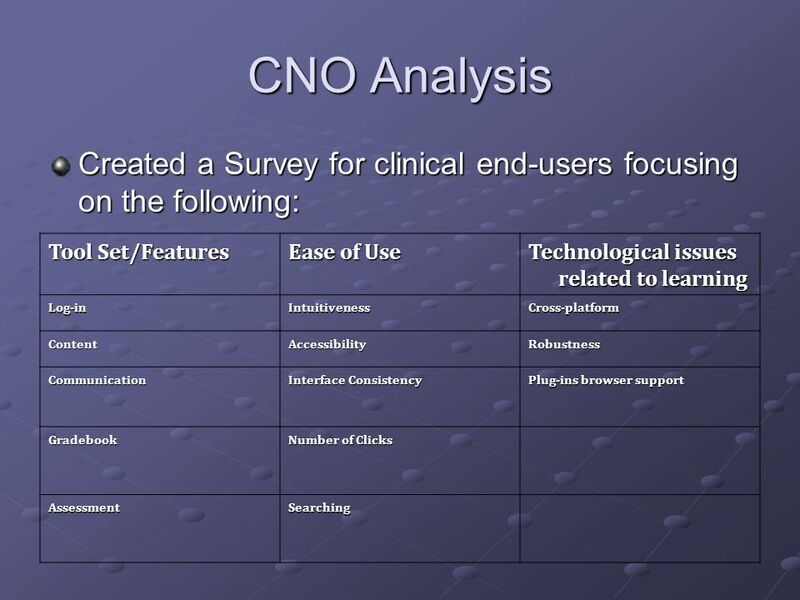 10 CNO Analysis Created a Survey for clinical end-users focusing on the following: Tool Set/Features Ease of Use Technological issues related to learning Log-in Intuitiveness Cross-platform Content Accessibility Robustness Communication Interface Consistency Plug-ins browser support Gradebook Number of Clicks Assessment Searching In order to ensure we selected a system with which the end-users were comfortable, in partnership with my DON, we created a survey and surveyed staff members who would be effected by this implementation. This survey focused on Tool Set/Features, Ease of Use and Technological issues related to learning. These are the images of the charts we developed based on the survey feedback. This survey was also used as a tool to gain buy-in for a number of clinicians who were not supportive of this initiative. Through this survey and an opportunity to demo the system, however begrudgingly, they realized that this system would make their lives easier by tracking all of the trainings they currently have to fill out paperwork and submit to HR in order to keep their records up to date. A new system, will actually increase efficiency for them and they won’t have to waste time anymore filling out forms! 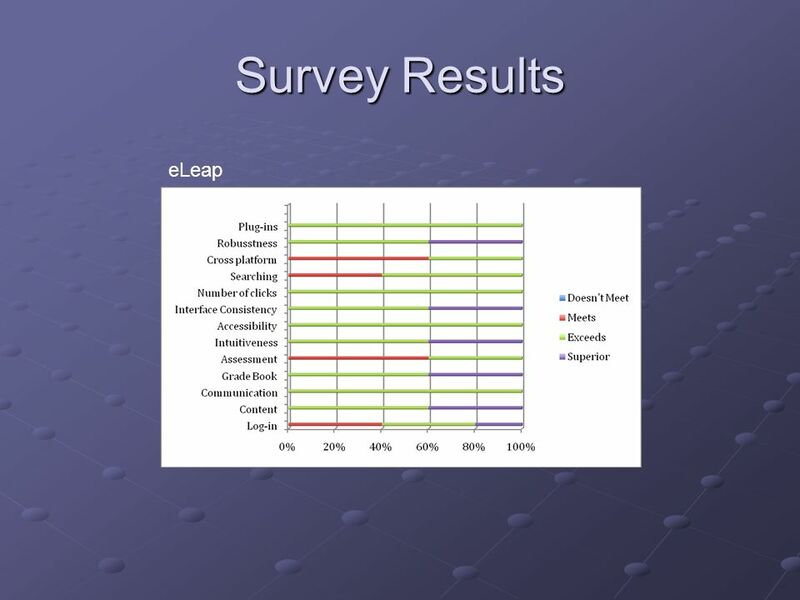 12 Survey Results eLeap As you can see by the chart, this survey has led me to feel that eLeap would be the best fit, followed closely by Solo Learning. Both found the eLeap pricing structure and proposal to be confusing. 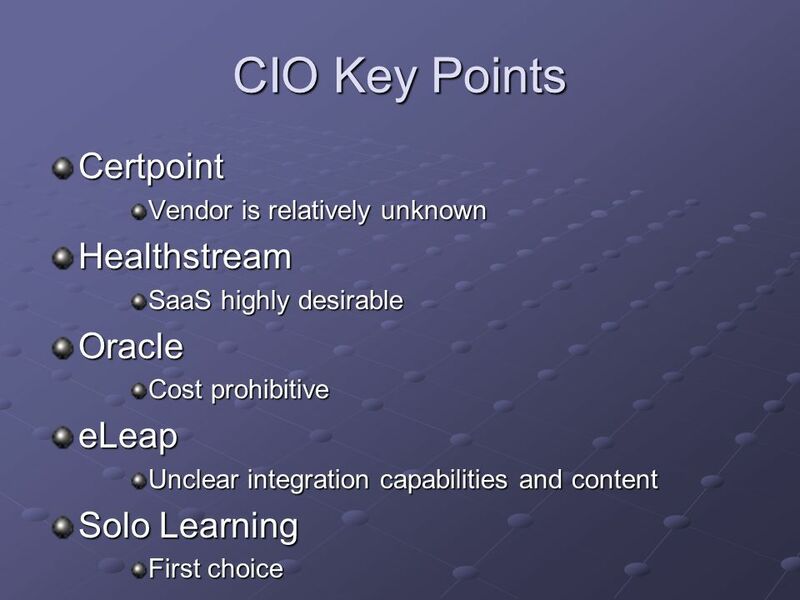 The software was not clearly SaaS, which they thought would be better to meet the CIO’s preferences. Therefore, eLeap was graded lower. Oracle failed to provide references and their pricing was high. However, company reputation and ability to fulfill needs helped them out. A negative for healthstream was their inability to allow ad hoc reporting out of the box, requiring 3rd party involvement. However, they wrote a good proposal. Solo’s pricing was good but functionality lacking. 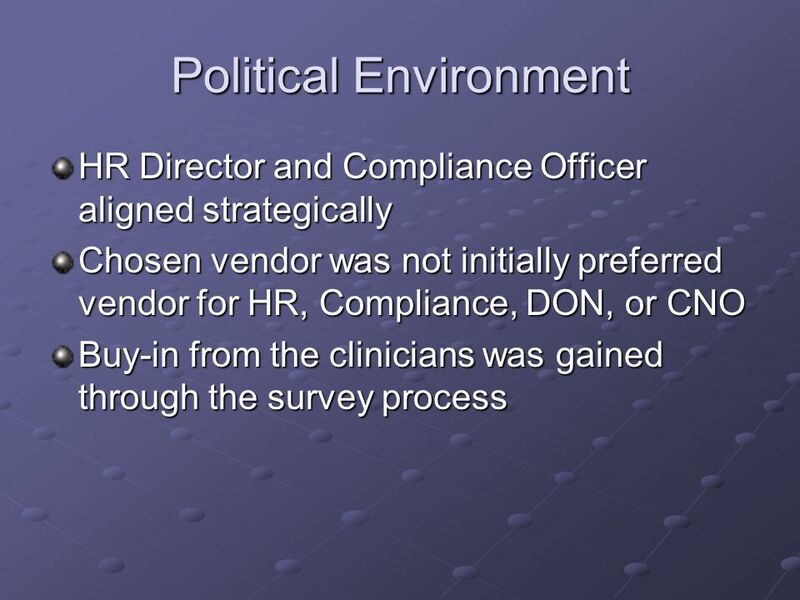 HR Director and Compliance Officer aligned strategically Chosen vendor was not initially preferred vendor for HR, Compliance, DON, or CNO Buy-in from the clinicians was gained through the survey process The Delphi approach was used for the vendor selection process as well as our original Scope of Work development. As you have seen, each of the team players was given a score sheet to evaluate the responses to the Requests for Proposal. The plan had been to have each fill out their own score sheets and turn them in for review by the team. As you have seen, the HR Director and Compliance Officer chose to collaborate on this effort, as did the CNO and DON. The compliance officer anticipated trouble ahead with the HR Director due to her residual resistance to an LMS and decided that since they had a very good relationship, he would invite the HR Director to work with him on the ratings of the requests for proposal. This gave the compliance officer not only an opportunity to advise the HR Director in setting ratings, but also an opportunity to make her feel better about the LMS implementation in general. Walking through each of the proposals and all of the specific items which each vendor could accomplish allowed an opportunity to highlight how these things could benefit HR. As they moved toward completion of the task, the Compliance officer heard out the HR director’s concerns and was able to show her that the LMS was actually a good solution for the HR department as well as the hospital as a whole. In addition to education as a means for the Compliance Officer to win over the HR director to becoming supportive of the LMS implementation, he was able to listen to her concerns and agree to support the HR director in increasing staffing for other compliance-related issues which needed support. These were areas much better addressed with increased headcount than with a technology solution. Both the CNO and the DON initially thought the whole thing was a huge hassle because the staff are in the middle of a long implementation of an enterprise EMR. They are swamped and were reluctant to participate on the selection committee. However including them in the process turned out to be a terrific way to get their buy-in. As you have seen, they ended up developing a survey together which in turn brought the entire nursing staff into the process. They gave valuable input which helped to affirm the vendor selection. The CFO had initially been concerned about a LMS not being included in the budget and how it will be financed. However, he knew that reserve funds were available for Joint Commission issues and he supported the CEO who has a quality initiative on his strategic plan just approved by the board. The CEO hates any JCAHO black marks and was driving a solution from the top down. So, the CFO’s focus had been on making sure that the job was done at the most reasonable cost. The CIO was most concerned with making sure that the LMS did not add to the current overload on his resources due to an EMR implementation and had pushed for an SaaS model for this particular system. 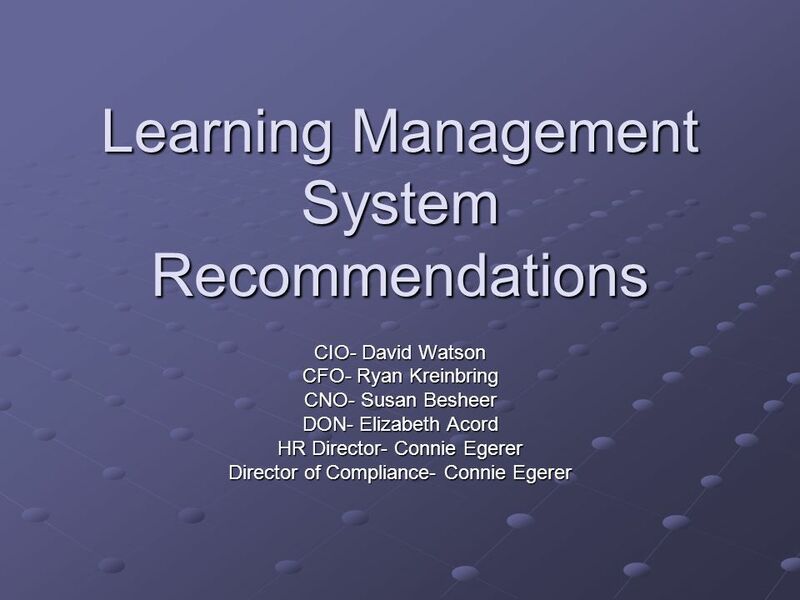 The HR Director and Compliance officer were strongly focused on the features offered in the LMS, and when the first round of the Delphi process was completed, they had selected Oracle, while the CNO and DON had chosen eLeap, followed very closely by Solo Learning. The CFO and CIO working separately had each selected Solo Learning. The results were gathered together and there was a discussion held as to the benefits and weaknesses of each system. The CNO and DON were easily persuaded to select Solo Learning, as they saw very little difference between them. The HR Director continued to express concerns that a functionally less than optimum system could still end up being a drag on HR resources and was resistant to going to Solo Learning. 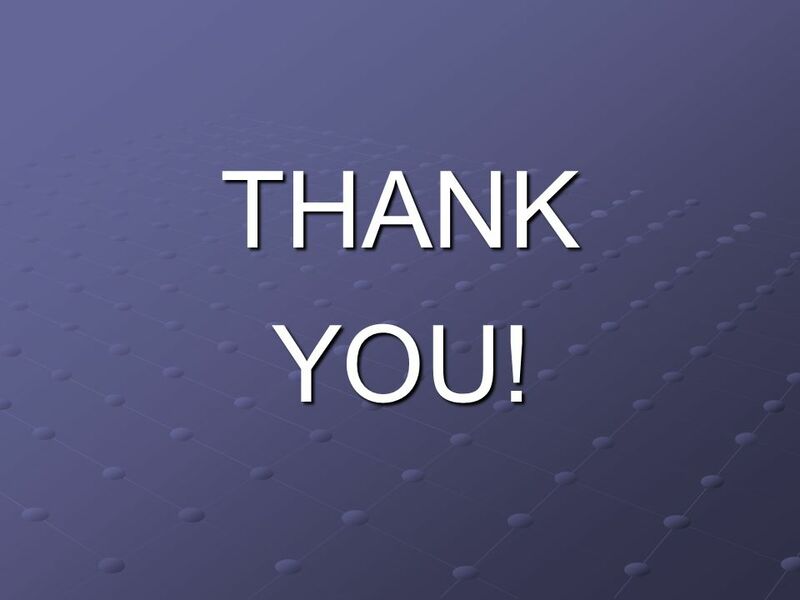 However, with the support of the Compliance officer, they were able to obtain support from the CFO for another HR position in the next fiscal year to support other project needs. 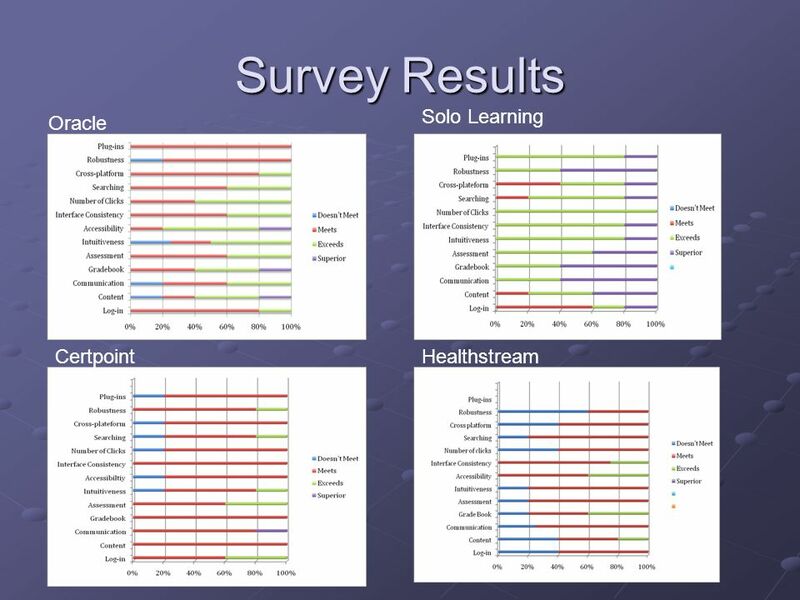 This satisfied the HR Director and on the last round of voting, everyone selected Solo Learning as their vendor of choice. Training-- Superusers Communication Plans ITIL : The goal of the Change Management process is to ensure that standardized methods and procedures are used for efficient and prompt handling of all changes, in order to minimize the impact of change-related incidents upon service quality, and consequently improve the day-to-day operations of the organization. ISO_20000 defines the objective of Change management (part 1, 9.2) as: To ensure all changes are assessed, approved, implemented and reviewed in a controlled manner. In order to realize a successful implementation and continue to keep the momentum going on this project, it is important to have the appropriate change management processes in place. 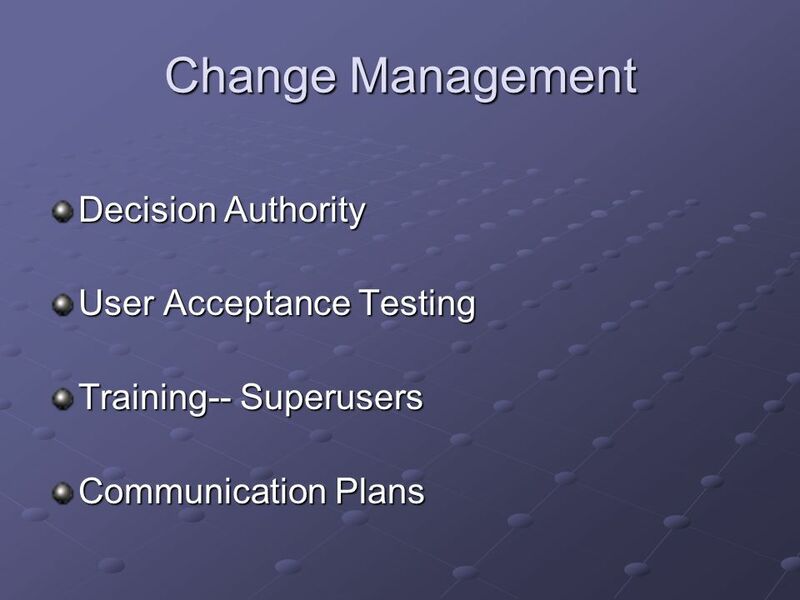 There must be a process in place for the actual technological aspects of this implementation and it will be important for us to work with our final vendor to establish an appropriate change management process where both their changes as well as our requested changes are approved at a senior level. The decision authority for this type of change management will rest with an established team comprised of the HR Director, the Compliance Officer, the CFO, the CIO and the CNO. In addition, the importance of organizational change management should not be over-looked. It is crucial in this environment for these changes to be successful and order for them to be successful, support must be built for the change and the lines of communication must be kept open to all stakeholders involved in the project. Information regarding this implementation should be shared immediately. In order to gain buy-in it can be shared immediately that one of the top two vendors from the clinical stakeholder survey was selected. This will allow the team to see that their voices have been heard. Front-line supervisory staff should be asked to select superusers and there should be rewards and incentives in place for participation. A united front must be presented by the senior team in order for the entire hospital to buy in. 16 Cumulative Rankings As you can see above our top two vendors that we utilized for our final discussion session were HealthStream and Solo Learning. Due to a situation fraught with political tension, it was important for us to utilize a tool to narrow down our options objectively in such a subjective environment while still giving all team members the opportunity to weigh in. As you can see, we did choose what ended up to be our top-ranked vendor, which was lucky for us. Do keep in mind that following this process, that may not always be the case. Download ppt "Learning Management System Recommendations"
Life in the Corporate Law Department: Mountains to Climb (aka Working with Corporate I/S) Mike Russell Liberty Mutual Group Boston, MA LawNet 2001: A Technical. Logi XML — Gartner Magic Quadrant for BI platforms 2013 leaders ability to execute completeness of vision Logi XML Tableau Software Tibco. November 19, 2013 Preparing a Successful RFP to get Desired Results. Chapter 8: Evaluating Alternatives for Requirements, Environment, and Implementation. ECM RFP 101 Presented by: Carol Mitchell C.M. Mitchell Consulting. © 2007 COPLAN AND COMPANY. All Rights Reserved. Permission granted for use by HIMSS membership. 1 Procurement Management Scott R. Coplan, PMP Educational. 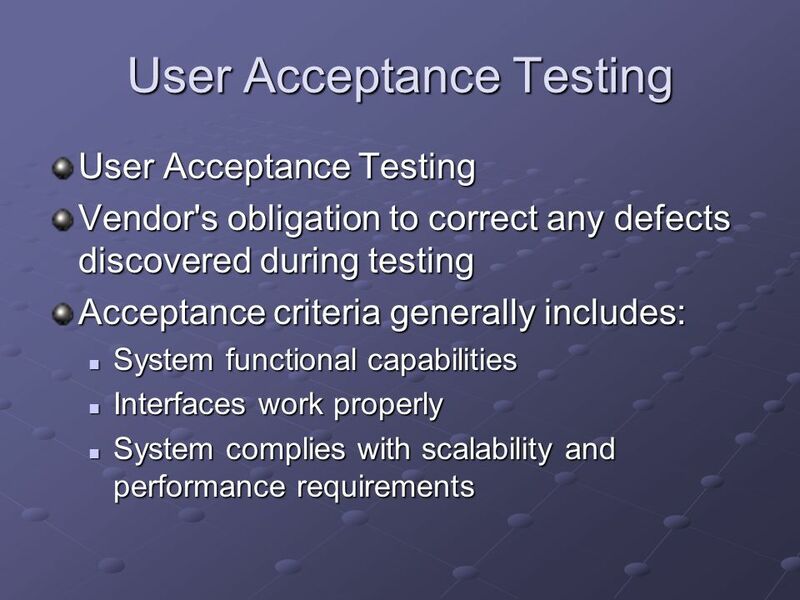 Software Application Acquisition – Not a Simple Task! Eddie Whitfield CPIM, CIRM, CSCP, P.E. 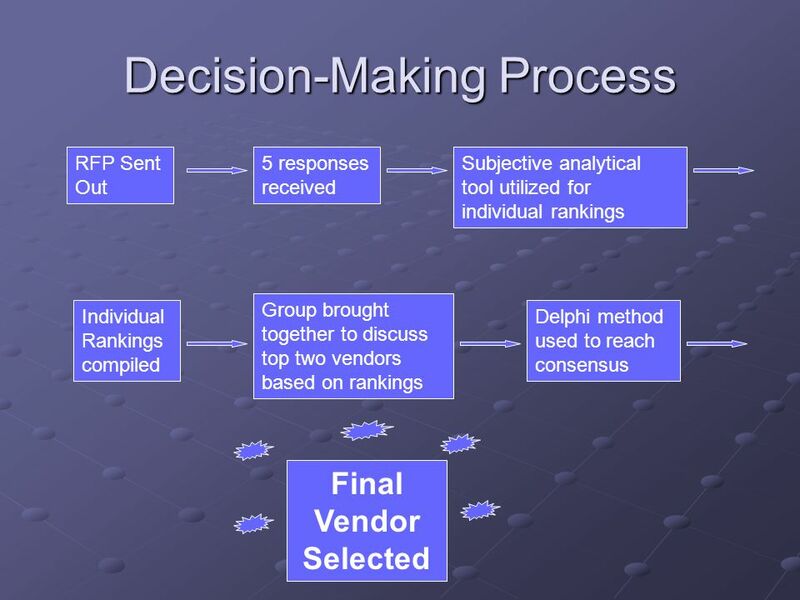 Panorama Consulting Group LLC ERP Assessment, Selection, and Planning SAMPLE APPROACH. Central v. Local v. Collaborative? How should decisions be made? Public Relations Research Priorities International Delphi study by Dr Tom Watson, Bournemouth University, UK. 8 Systems Analysis and Design in a Changing World, Fifth Edition. Presentation How Business Intelligence can help to address current NHS challenges Chris Knowles, Oracle Corporation, Principal Sales Consultant. SaaS Software Container By Brian Moore Paul Kopacz. ORGANIZATION MODELING OVERVIEW Dr. Denice D. Withrow, ISC May 20, 2013 Cleveland Chapter Presentation.